This cute bunny art card is made with a glossy postcard of my original oil painting " Blue Bunny", featuring an adorable bunny. It would make a perfect Easter Card or Birthday Card for the bunny lover! The postcard is secured to the 5 x 7 inch white card with black photo corners, and can easily be removed and sent to a friend. The title of the painting and my signature are on the front of each card. The inside of the card is left blank for your own personal greeting. The back of the card contains printed information about the original painting and indicates that 10% of the purchase price of each card is donated to Friends of the Animal Shelter in Phoenix, OR to assist with animal care and rescue. See below for exact wording. The card and matching envelope are enclosed in a clear cellophane sleeve for protection. It will be shipped in a 6 x 9 inch manilla envelope with cardboard support to ensure it arrives in good condition. Please note that the image of my painting above is protected by copyright law. Any reproduction or copying of the image or card is illegal. This copyright will not transfer with the sale of this work. 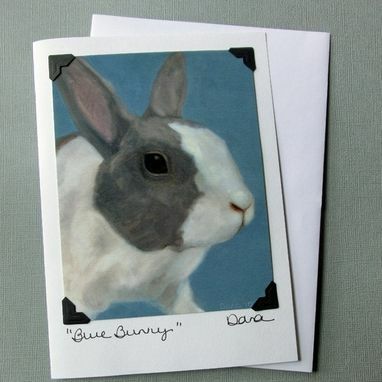 This greeting card is made with a postcard featuring my original oil painting of a sweet rabbit, titled "Blue Bunny". The postcard can be easily removed from the photo corners and sent to a friend. Ten percent of the proceeds from the sale of this card and other items featuring this painting is donated to Friends of the Animal Shelter in Phoenix, OR to assist with animal care and rescue. Thank you for your support!